The University’s brand represents our identity, which is a kaleidoscope of our actions, visual representation, voice, and shared values. 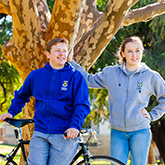 It embodies the essence of what is offered, promised, delivered and expected at UWA. This is who we are and what we stand for. You need to complete our online approval form. Staff, students and title-holders may use the logo for official University business. Use of University logo requires approval and this can be done via the online approval form. If you have any questions before submitting the form, email the University Brand Manager. When you have completed the form, it will be submitted to the University Brand Manager (or delegate) for review and approval. It takes approximately three working days for any requests to be reviewed and responded to, provided all information has been received. You will be notified via email regarding the outcome. Once a response has been determined, a copy of this form will be returned to you, outlining any conditions of use with which you need to comply with. We recommend that draft artwork be submitted with all requests to avoid delays.